Working with world-famous Swarovski cut-crystal beads, author Laura McCabe creates luminous necklaces, earrings, pendants, rings and brooches for beaders of every skill level. Laura provides complete step-by-step instruction for 20 projects (10 for beginners) and presents 50 more in a photo gallery of design variations, teaching readers how to vary colours and shapes to create custom effects. All 70 designs are made with only three simple beadwork techniques: flat peyote stitch, tubular peyote stitch and spiral rope. 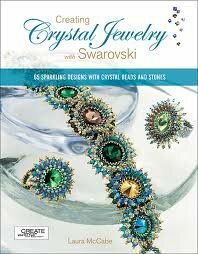 Laura also provides a chapter on making decorative embellishments, such as bezels, beaded leaves, star flowers, berry clusters and fringe. The concise instructions are illustrated with easy-to-follow illustrations.